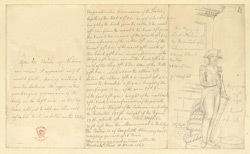 This drawing includes a detailed analysis of work carried out on Nelson's Column in 1843. In 1806, Londoners paid their respects and said farewell to Lord Nelson. Such was Nelson's popularity that dense crowds gathered to watch the funeral procession as it snaked its way from Hyde Park to St Paul's Cathedral. The processors included naval comrades, militia regiments, officials, government ministers, the Lord Mayor and his Aldermen, noblemen and the Prince of Wales. The architect of Trafalgar Square, Sir Charles Barry, did not like the idea of a memorial column to be placed at its centre. However, due to the enormous popularity of Lord Nelson, his wishes were overruled and work commenced on the structure in 1840.